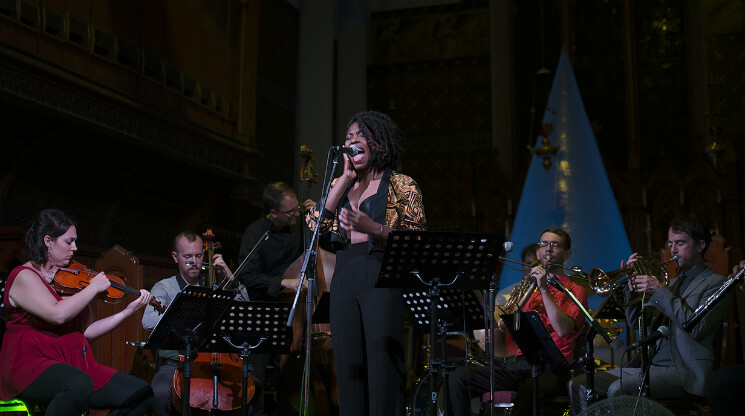 In their first performance outside of their native Toronto, the Queer Songbook Orchestra left a lasting impression through their pairing of enticing musical arrangements, powerful vocalists and striking narrative, unleashing the unifying power of music on their Ottawa audience. Looking back at the last 100 years of popular music, each song in their repertoire was introduced with a brief story explaining the song's connection to the LGBTQ community, delving into either the personal or historical significance. On the personal side, one narrator told a story of hiding a love of alt-rock from metalhead friends in the '80s before the 12-piece ensemble delivered a heartfelt rendition of the Smiths' "Please, Please, Please, Let Me Get What I Want," while another told a story of an obsession with k.d. lang coinciding with newfound sexual preference, which was followed by their interpretation of her track "Constant Craving." Historically, the group looked at the previously unseen queer overtones of Lesley Gore's 1963 song "You Don't Own Me," and the secretive sexualities of Billy Strayhorn and Lorenz Hart with show-stopping arrangements of "Lush Life" and the original "Blue Moon," respectively. Much more than your average cover band, their performance was one not to miss.